Today we have the great pleasure of hosting Paul Kane - author, editor, journalist, and Hellraiser scholar extraordinaire. 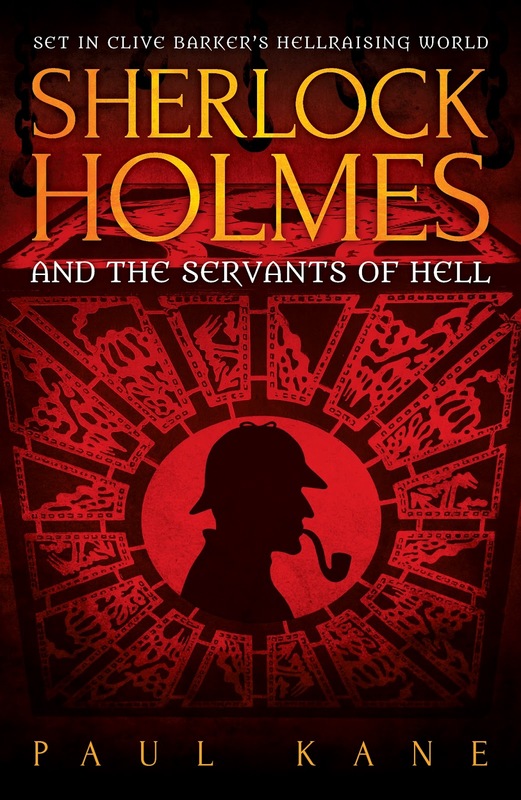 If you haven't already picked up a copy of Sherlock Holmes and the Servants of Hell, then I urge you to do so at your earliest convenience. I first came across the fiction of Clive Barker, like a lot of people, back in the 1980s. I’d already been introduced to horror at a ridiculously early age, when a mate handed me a copy of James Herbert’s The Rats in the school yard and told me I’d like it; he wasn’t wrong. From that moment on, I lapped up anything by the likes of Ramsey Campbell, Stephen King, Anne Rice, Graham Masterton, Richard Laymon and so many others, as well as seeking out as many of the video nasties of that era I could get my hands on – usually lent to me by older relatives of my friends. 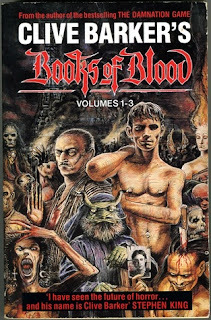 It was little wonder then, that when I saw a copy of Books of Blood on the shelves in my local bookstore I grinned from ear to ear and just knew I had to have it. This was the omnibus edition – we lived in quite an out of the way place, so the individual ones probably wouldn’t have made it up to us – with the Barker artwork on the cover, though I didn’t know at the time Clive drew and painted as well. Didn’t know he wrote for the theatre and acted, nor that he’d made short films either by then. All I knew was the book looked awesome and all that stood between me and it was putting the pocket money I’d saved down on the counter. I ran off with it and started reading even before I got home… to be honest, I’d started reading it in the shop so I was just continuing on with it. After the glowing introduction by Clive’s fellow Liverpudlian Ramsey Campbell came the first part of the framing titular story, about a man who pretends to talk to the dead, to tell their tales, and suffers the ultimate price for it: they begin to write their stories on his skin; a human Book of Blood! Wow… Such a cool device, but there was also something that transcended the horror here – and I found this time and time again as I read those tales. ‘Midnight Meat Train’, for instance, doesn’t just present us with a psychopathic serial killer – which would have been enough for most horror writers of that time – it gives us the totally mind-blowing reason for the murders. The same was true of story after story, and even without the recommendation from King saying that Clive was the future of horror, I could see that these collections were going to be a game-changer. No two tales were the same, ranging from comedy horror in ‘The Yattering and Jack’ to rampaging monster horror in ‘Rawhead Rex’, to horror that contemplated what it was to be us, in the aptly-named ‘Human Remains’ (one of the best short stories of all time, in any genre). As you can imagine, I sat and waited patiently for more stories and books – re-reading the one I was lucky enough to have stumbled upon in the meantime. Volumes 4-6 followed, and Clive’s first novel, the utterly brilliant Damnation Game, and then…something else. Something which captured my imagination like nothing before or since has ever done. That something was The Hellbound Heart in an anthology called Night Visions, edited by George R.R. Martin – and I don’t think it’s too much of an exaggeration to say that my life would never be the same again. Immediately I fell in love with this tale of an obsessive man called Frank, who’s seeking the ultimate pleasure by opening a puzzle box, only to discover that the demons he summons – the Order of the Gash, more commonly known as Cenobites – have a very different idea of pleasure to him. At the same time, his former lover Julia has married his brother and they’ve moved into the house where Frank vanished – and where a spilt drop of blood brings him back…sort of. There was just so much to admire here, from Clive’s writing again of course, to the simple yet overwhelmingly complex story; the idea that a doorway to another world could be opened up in a house that might be down the street from you was utterly terrifying. And that’s even before you realise what the Cenobites can do to you! It was a story that made me smile as much as it sent shivers down my spine. Oddly, when I first saw Hellraiser – or maybe that should be when I first saw the video cover, because I hadn’t been old enough to see it at the cinema and still wasn’t 18 so I couldn’t rent it from out local video store – I didn’t make the connection with its source material. Perhaps it was because I was so blown away by the cover image of the guy with nails banged into his skull, or the picture on the reverse of a skinless man. However, when I finally got to see it properly, borrowing it from a friend’s brother and waiting until my folks were out shopping, I put two and two together…once I’d stopped shaking, that was. Not many horror movies frightened me back then – they still don’t – I was too desensitised; but that first encounter with the film scared the crap out of me, when I wasn’t grinning like a loon at discovering such a gem. Again, it was the thought that all this could be happening not a stone’s throw away – although I didn’t really know it back then, it was an example of British New Wave, or Kitchen Sink drama…it just happened to have sadomasochistic demons in it. From that moment on, my fate was sealed and my life would be forever linked with both Clive and Hellraiser. As the years passed, and I watched more and more of the sequels, collected the comics and everything else, I also found out more about what a creative force Clive is and kept up with his books – which still contained elements of horror, but were moving more and more towards dark fantasy. In fact, they were becoming unclassifiable in some cases, as his writing happily transcended genre categories to become – quite rightly – a genre in itself. I went to art college, then university and then broke into freelance journalism, with a specialism in genre writing. I reviewed films for my local paper and started a Film Studies MA course, with an eye to maybe writing a few books on film myself. It was a no-brainer that at some point I’d write about Hellraiser – my aim being initially to do a kind of BFI style book about the first movie, like Mark Kermode’s one on The Exorcist. I couldn’t get much interest in that sadly, but after I sent some samples in to a publisher called McFarland they suggested I should write about the whole movie series – eight by that time – plus relevant comics and short films. I ummed and ahhed about doing it, because I knew it would be so much work, but my best friend Marie O’Regan – now my wife of ten years – convinced me that if I didn’t do it, I’d always regret it. She was absolutely right, I would have. The book might have taken years to research and write, but it filled a much needed gap in the market and has become a sort of bible for fans of the series – even ending up being the illustration for the Hellraiser Wiki page. Around the same time I’d been writing it, I became Special Publications Editor of the British Fantasy Society – an organisation Clive had been a huge part of twenty years beforehand, before his move to the States. My first project was to put together a calendar based on the Gawain and the Green Knight legend, involving some of the biggest names in SF, Fantasy and Horror. And the person we approached to do the introduction was Clive. As busy as he was, he said yes… It would take a week for the smile to fade from my face. This and the publication of Legacy were the things that put me on Clive’s radar. The things that led to our inviting him over to be a Guest of Honour at the 2006 FantasyCon – where I finally met him in person, found out that he was lovely and interviewed him live in front of an audience of about 600 fans, my grin of delight plain for everyone to see – that led to many interviews and chats on the phone, the suggestion of a Hellraiser anthology called Hellbound Hearts which I would co-edit with Marie… All of it. And, believe me when I say I still pinch myself on a daily basis. It’s one of the reasons I felt so comfortable sounding him out about my idea to do a Sherlock Holmes/Hellraiser crossover. 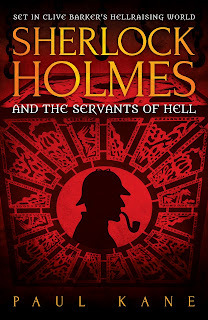 I’d discovered the Conan Doyle stories around the same time as Clive’s fiction, and had watched Jeremy Brett bring the character to life in the Granada TV show at the same time I saw Hellraiser – so in my mind there was that link. The same kind of link there was now between Clive, Hellraiser and me. 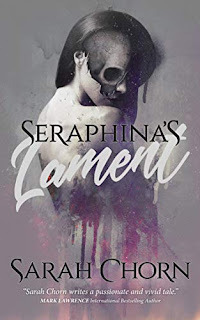 Thankfully he loved the sound of the novel that would become Sherlock Holmes and the Servants of Hell, loved the detailed outlines for it and sample chapter, and loved it when we found a supportive publisher in the form of Solaris. 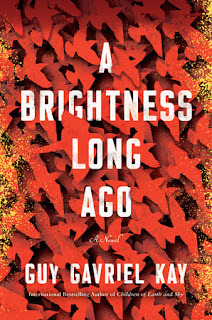 At the time of writing this, the book came out last week and seems to be doing very well. People are reading it, people are enjoying it. 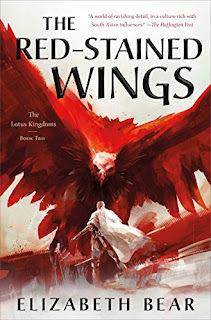 One kind reviewer even called it a ‘masterwork’, which is another one of those pinch yourself moments for an author. Which brings us pretty much up to date. I’m not sure what the future will hold, not for myself, not for Hellraiser nor for Clive – but I am sure that all three of us will be always be linked now. I think we always were, really, even though none of us realised it. It’s something that, when I think about it, always makes me smile.